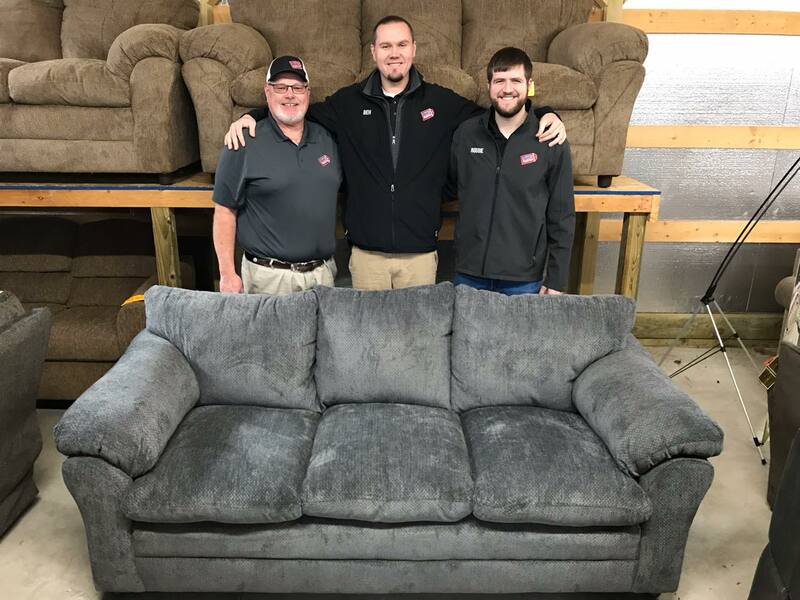 Paul Lowe (left), Big Ben Lowe (center) and Robbie Hisey (right) stand behind the beautiful new sofa Lowe's Bargain Barn Furniture is giving away to thank their customers during the holiday season. Directions for the giveaway: Head over to Lowe’s Bargain Barn Furniture’s Facebook Page, like the page, share and comment on the giveaway post for a chance to win. The winner will be chosen through a live Facebook video on Dec. 22 at 12 p.m. While operations have morphed over the years at Lowe’s Bargain Barn Furniture, one thing has stayed constant through the generations, the tradition of family. Family owned and operated business has held true with the new and used furniture company in South Zanesville. With its founding in 1984 by Ferrell and Barbara Lowe, the family has carried their legacy into nearly 35 years of business. Big Ben Lowe, current part-owner, said his grandfather was looking for a new opportunity to make a difference in the community. Ferrell decided to open a used furniture store where customers could get the furniture and appliances they needed without spending a fortune. Along the family line, Ferrell Lowe founded the company, which originally focused more heavily on used furniture. His son, Paul Lowe, who was an educator for 10 years, joined the family business in 1991. Paul Lowe brought in more of the new furniture aspect into the business. Following the family trend, Paul’s son, Big Ben, came into the business in 2011 and helped to bring the store online and alter marketing tactics to apply to a large range of customers. A jack of all trades, Ferrell wore many hats throughout his lifetime from working at Ford Motor Company in Cleveland, Rockwell International and being a preacher. His ethics, tradition of honesty and morals formed the foundation of Lowe’s Bargain Barn Furniture. “We’ll always take a loss to make sure we’re doing the right thing,” Paul said. In the mid-nineties, the company started getting more new furniture as used furniture began to fade out. Today, Lowe’s Bargain Barn furniture sells about a 70 to 30 percent split between new to used furniture. With three generations of family under their belt, the Lowe family joked that the fourth generation is in the “toddlers in training program,” but will take over soon enough. Lowe’s Bargain Barn Furniture specializes in selling new quality furniture, new mattress sets and new appliances at low prices with great service and quick delivery. People don’t have to spend a fortune to have great quality, great warranties and great service in the Zanesville area. “Being that we are a small business … we try to diversify and we try to have the best selection for the widest group of people possible,” Big Ben said. While none of the family members necessarily planned on coming into the business, it’s a job that they’ve all come to love. Paul was a teacher for 10 years before joining his father in his business endeavor. Paul Lowe’s wife, Wendy, also helps out on the business side of things. A retired middle school math teacher of 35 years, Wendy is well known and has developed great connections in the community. In addition to Wendy, Ferrell Lowe’s widowed wife, Barbara, 84, also helps out with the business by keeping the books, a task that she has taken on for many years despite her family’s reassurance that they could take the work off of her hands. The last family member wrapped into the business is Big Ben Lowe’s brother-in-law, Robbie Hisey. After graduating from college as a psychology major and certified personal trainer, Robbie was looking for a more stable job than many opportunities recent graduates pursue. While Lowe’s Bargain Barn Furniture is a little outside of his field of study, Robbie said the company has provided him with great opportunities over the past year and a half he’s been with the company. Big Ben and Robbie came into the business at a time when Paul needed some extra hands to help with the amount of volume the store was reaching. Since then, the business has grown exponentially. During his senior year of college, Big Ben, a then accounting and marketing double-major, worked on a marketing project focused on the business model for Lowe’s Bargain Barn Furniture. Ever since that project, he decided the family business is where he wanted to be. Over the years, a few non-family members have been hired to help out with the business, but none that Big Ben said have taken to heart the meaning of the business, which goes beyond just selling furniture. “We just kind of all work together,” Paul said. As Big Ben and Paul Lowe always say, they aren’t like other stores. This is a sponsored story paid for by Lowe’s Bargain Bain Furniture. The nature of a sponsored story allows for subjective content. Don’t forget to enter to win in the Lowe’s Bargain Barn Furniture giveaway by Dec. 22. I have no sofa, would like it.